GKIDS has announced the English voice cast for MFKZ, a collaboration from French comic artist Guillaume “Run” Renard, original creator of the comic series, and ultra-hip Japanese animation house Studio 4°C, creators of the acclaimed anime features “Tekkonkinkreet,” “Genius Party,” and “Mind Game.” The film will feature the voices of Michael Chiklis (The Shield, American Horror Story), Giancarlo Espositio (Breaking Bad, The Usual Suspects), Jorge Gutierrez (The Book of Life, Son of Jaguar), Dascha Polanco (Orange is the New Black, Joy), RZA, Vince Staples, and Danny Trejo (Machete, Predators). The event will also include an exclusive behind-the-scenes look and interview with the film’s creators. MFKZ centers on young Angelino and his skull-and-flame pal Vinz, who live in a seedy tenement in an L.A.-inspired dystopian metropolis – a burnt-out, gang-and-cockroach-ridden, neo-urban hell. Following a scooter accident Angelino starts experiencing migraines, strange hallucinations and fits of rage-inspired superpowers, as he slowly awakens to the truth of his origins: he is half human and half Macho, a supernatural alien race that is bent on taking over the planet. 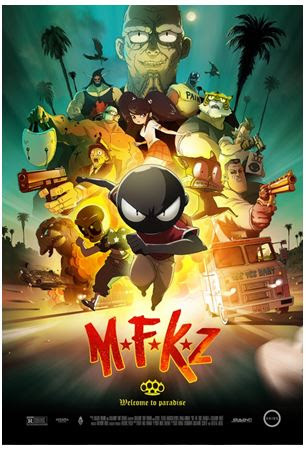 Released by GKIDS and Fathom Events, MFKZ debuts in U.S. cinemas on Thursday, October 11 at 7:00 p.m. (local time) with an encore on Tuesday, October 16 at 7:00 p.m. (local time). Both showings are dubbed in English. Tickets for MFKZ are available now at www.FathomEvents.com, www.mfkzmovie.com or at participating box offices.